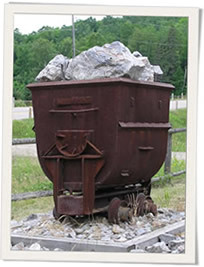 As you make your way down the path towards the rock farm, you are walking past a rock face on your right that was a part of one of Bancroft’s most interesting mining operations – the quarrying of the deep blue mineral called sodalite. During her visit to the 1901 World’s Fair in Buffalo , New York , the Princess of Wales was so captivated by a gift of Bancroft sodalite that arrangements were made to quarry enough to decorate her London residence, Marlborough House. In 1906, these hillsides were worked by the owners of the property for this mineral and shortly after, 130 tonnes of the rock were shipped to England to be used as a decorative stone in the Princess’ royal home. 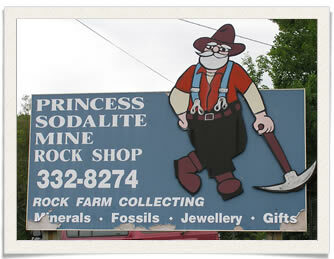 And that is from where the name “Princess Sodalite Mine” comes. Today, sodalite is commonly used in the creation of jewelry and as an ornamental stone. 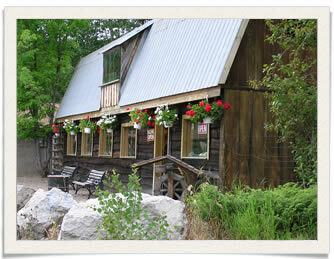 It is also the mineral most people associate with the uniqueness of the Bancroft region’s mineral heritage. 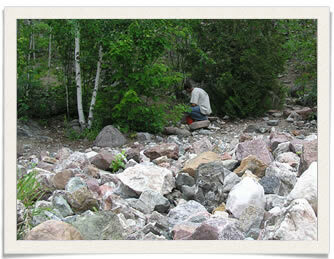 The pieces of sodalite you will find in the rock farm vary in the intensity of blue. Look for pieces that are a deep blue colour. Surrounding the mineral you will usually find a grayish-white mineral called nepheline. 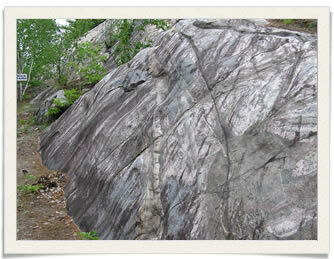 Nepheline syenite gneiss (pronounced “nice”) is the main rock which surrounds you. 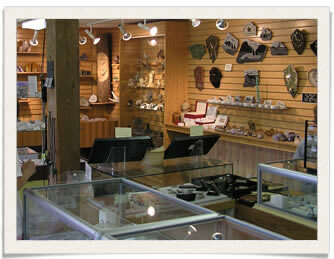 Since 1961, when the site was first opened to collectors, visitors have been made welcome. 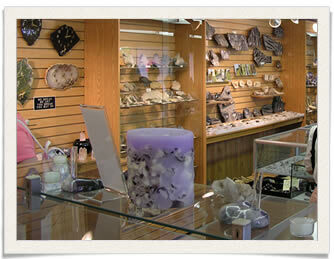 Andy Christie, the current owner, will do his best to make your visit a worthwhile experience. Good collecting! The rock farm is always changing; new “crops” are added while others are being collected. 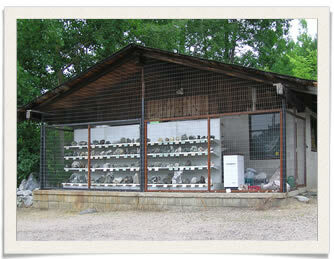 But there are some rocks and minerals which you can find most of the time at the farm. Take your time when you’re collecting. Look, pick-up, look some more until you find a piece that you are happy to take home with you. I have inherited my dads rock collection and they don’t all have names on them. I was wondering if I. Fought the collection to you if you could tell me the names of his specimens? Could you please tell me if i could dig up my stones on your property? Looking for a new home for my lapidary equipment. I’m located in Sault Ste Marie Ontario. I can be emailed at [email protected] for details and photos.